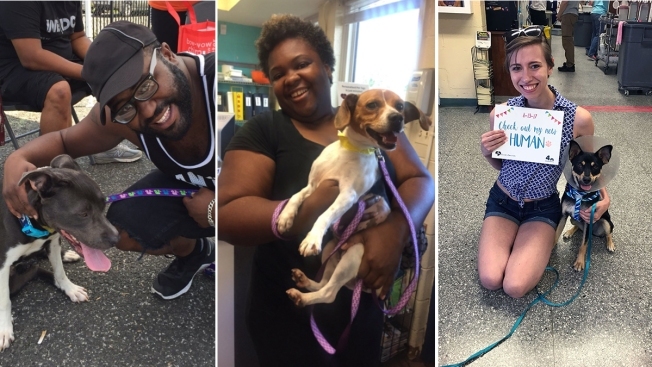 More than 1,300 cats, dogs and other pets have been adopted in the D.C. area as shelters across the country waived adoption fees Saturday for Clear the Shelters, a nationwide pet adoption drive. One of those animals was Pookie, a 9-year-old brindle hound who faced a long journey to his forever home. Pookie had matted fur and skin irritations before staff at the Animal Welfare League of Arlington treated and groomed him. He was born in West Virginia and lived with two families there. When one of his owners got sick, she gave him up to a West Virginia rescue. That rescue transferred Pookie to the Animal Welfare League of Arlington, where the shelter groomed his matted fur and treated his skin irritations. Then they put Pookie's photo online. And that is how Roger of Nazareth, Pennsylvania, found his new furry friend. "He had just fallen in love with him from a picture," said Chelsea Lindsey, a communications specialist at the Animal Welfare League of Arlington. Pookie's new owner drove 4 hours to adopt him after seeing his photo online. Saturday afternoon, Roger and Pookie made the 4-hour drive home to Pennsylvania together. Though Clear The Shelters may be over, there are still animals hoping for a home. Check our interactive map for a list of shelters who were our partners in the event. Hugo, a deaf, white-and-brown dog with perky ears, was still waiting for his forever home Saturday afternoon. He cannot hear, but he knows his own sign language and will sit with a simple hand signal. Hugo is at the Humane Rescue Alliance on Oglethorpe Street in northwest Washington. Kathy, from Montgomery County, visited a shelter to find a new companion after her long-time cat passed away. She spoke to NBC Washington while holding a tabby kitten. "There's so many animals here. Adopt, don't shop," she said. Many people were lined up hours before opening Saturday at the Humane Rescue Alliance. A would-be adopter named Maria said she arrived at 2 a.m., hoping to adopt a Labrador puppy that she'd seen on News4. 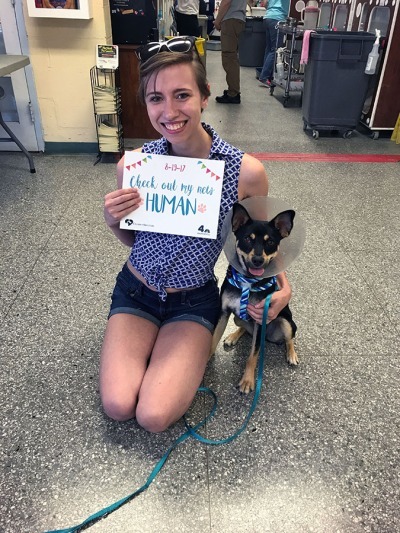 Maxamillion was the first pet adopted from the Baltimore Humane Society on Clear the Shelters Day 2017. Around 10:30 a.m., the Baltimore Humane Society announced its first adoption: a dog named Maxamillion. Marcel Green was another early adopter. He started waiting outside the Humane Rescue Alliance at 4 a.m. Saturday to adopt a pup for his mom. More than six hours later, Green and his father, Bruce Green, went home to Gaithersburg, Maryland, with a 2-month-old chocolate-colored puppy. Tanya, a social worker from Silver Spring, adopted a boxer mix named Roxy. "As a social worker, I work on putting children with families," she said. "I'm really happy to have an event like this because animals need love and affection, too." Many shelters require every person in a household to meet an animal before adoption. Tanya brought her children to meet Roxy at the Humane Rescue Alliance. "We're a dog family," she said. "It was a family decision." Kristie talked with NBC Washington while volunteering at the Human Rescue Alliance. "Rescues are the best way to go," Kristie, who has three rescued cats, said. "It's always a win-win situation." She watched several people adopt cats today. One of those people was D.C. resident Raymond White. He was watching News4 when he saw a gray and white cat. "They said come and adopt a cat, and I always wanted one," he said. White named his new furry friend Blessed. Nationwide, more than 61,600 pets have been adopted during 2017's Clear the Shelters. In addition to dogs and cats, plenty of more unusual animals were adopted Saturday. The first adoption from the Animal Welfare League of Arlington was a group of seven mice. A colorful sun conure bird named Beaker will brighten the homes of his new owners. Other adopted animals included guinea pigs, ferrets, miniature pigs and rabbits. Clear the Shelters is a partnership with NBC Owned Television Stations and Telemundo.